People who are considering orthodontic treatment in Ashburn & Woodbridge VA usually come prepared with great questions when they consult orthodontics specialists. 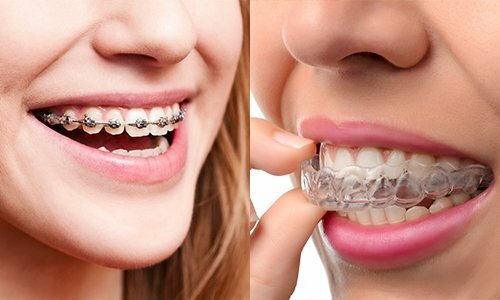 The question at the top of the list is often which type of appliance to use to correct their orthodontic problem – braces vs clear aligners? How do they decide? First, keep in mind that there is not a single “right way” for orthodontic treatment to be done. An accurate diagnosis is the starting place, and that’s something that orthodontists are especially well-trained at, after obtaining orthodontic records (x-rays, photos and models). The orthodontist pinpoints the problem and then crafts a customized correction. One appliance is not inherently better than another. What is used for an individual’s correction will be based on the goals of treatment, and the patient’s lifestyle needs. Some things, however, apply to all patients, regardless of type of appliance. For example, all patients must brush and floss their teeth daily and will need to wear retainers post-treatment. Now, let’s examine some common treatment factors to consider for both braces and clear aligners. tooth-colored ceramic and even gold-colored. While there are more inconspicuous options (tooth colored brackets, braces that go behind the teeth), other elements remain visible (rubber bands, wires or gold colored brackets). You can, however, choose the colors of your rubber bands. For a stable and functional result, braces remain affixed to the teeth throughout the course of treatment. On the bright side, you can’t lose them, unless you eat hard and sticky foods. There may be some initial discomfort when braces are placed or adjusted, and brackets and wires can temporarily irritate mouth tissue. Overall, the discomfort is short-lived and easily managed. Once patients become accustomed to their braces, they may even forget they have them on. Patients will need to keep teeth, gums and braces free of plaque and food debris so bacteria can’t attack tooth enamel or cause inflamed gums. Food debris and plaque must be removed by frequent brushing and flossing. Those with braces must steer clear of foods that are hard, sticky, crunchy and chewy to avoid breaking a bracket or popping a wire out of the bracket. Patients should opt for water instead of carbonated drinks, flavored waters, or sports drinks – these can contain acids and sugars, and both are bad for tooth enamel. Clear aligners are plastic replicas of your teeth. Wearing them puts gentle pressure on the teeth, ever-so-slightly repositioning them. Aligners are one of many technological advancements that have made orthodontic treatment less conspicuous and one of the many appliances orthodontists use to move teeth and align jaws. Aligners are clear, thin, plastic-like trays, making them virtually invisible and allowing an individual to inconspicuously achieve a straight smile. Tooth colored attachments are frequently placed on the teeth to help guide the teeth into place. Aligners are designed to minimize the appearance of the appliance to better fit any lifestyle. Many patients appreciate that aligners are removable. Take them out to eat, to brush and floss, or for short periods for work or social occasions. The key responsibility is wearing them as prescribed. That typically means a minimum of 22 hours a day and in the correct sequence. Because they are removable, aligners can be easily lost or damaged. They fall out of pockets and purses and may even get wrapped in a napkin and thrown away. While there may be some initial discomfort when a patient switches to a new set of aligners, the discomfort can be easily managed. Removing aligners because they are uncomfortable defeats their purpose. Aligners can’t work unless they are in the mouth. It is critical to avoid drinking soft drinks, flavored waters or sports drinks of any kind with aligners in. Liquids seep into aligners and if they contain acid, sugar, or both, it can rapidly lead to staining of the teeth and extensive decay. Teeth need to be spotless when aligners are placed in the mouth. The type of appliance used in orthodontic treatment is far less important than the skill in the hands of the person who is providing the treatment. 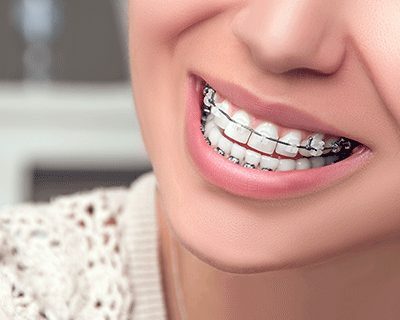 Rely on the skills of the American Braces & Smile Center orthodontists in Ashburn & Woodbridge VA, who has the education, experience and expertise to evaluate diagnostic findings, and translate those into a treatment plan that will help you or your child achieve a healthy and beautiful smile. Braces or Clear Aligners to choose? Stop wondering and click here to schedule your FREE orthodontic consultation in Woodbridge VA and Ashburn VA.